To examine the role of energy intake and dietary patterns in childhood and throughout adulthood on subsequent mammographic density. Prospective data were available from a cohort of 1161 British women followed up since their birth in 1946. Dietary intakes at age 4 years were determined by 24-hour recalls and during adulthood, average food consumed at ages 36 and 43 years by 5-day food records. Dietary patterns were determined by factor analysis. Associations between energy intake, dietary patterns, and percent breast density were investigated using regression analysis. During adulthood, energy intake was positively associated with percent breast density (adjusted regression coefficient [per SD) (95% CI): 0.12 (0.01, 0.23)]. The effect of the high fat and sugar dietary pattern remained similar when adjusted for total energy intake [0.06 (−0.01, 0.13)]. There was no evidence of an associations for the patterns low fat, high fiber pattern 0.03 (−0.04, 0.11); the alcohol and fish −0.02 (−0.13, 0.17); meat, potatoes, and vegetables −0.03 (−0.10, 0.04). No association was found for dietary pattern at age 4 and percent breast density. This study supports the hypothesis that overall energy intake during middle life is a determinant of subsequent mammographic breast density measured 15 years later. Mammographic density has been shown to be a strong risk factor for breast cancer . Previous epidemiological studies have investigated the relationship between individual nutrients or food groups and mammographic density with inconsistent findings. Some studies, but not others, [2, 3] have found a positive association with intake of total fat, polyunsaturated fats, polyunsaturated:saturated fat ratio, vitamins C and E [4, 5, 6]. The few studies that have published results on the intakes of protein, fiber, and carotenoid have also shown contradictory findings [2, 3, 6]. While the latest WCRF report concludes that there is ‘convincing’ evidence that alcohol intake is a risk factor for breast cancer in both pre- and post-menopausal women,  the result is less straightforward for mammographic density [6, 8, 9, 10]. Inconsistent findings across dietary studies that investigate the effect of single nutrients or food groups may be due to the failure of a single nutrient or food group to capture the dietary habit of an individual. A dietary patterns approach recognizes that foods are consumed in many combinations and that nutrient intakes are often highly correlated, with certain nutrients having interactive and synergistic effects. Furthermore, dietary patterns may be more stable over time than the consumption of individual foods [11, 12, 13]. A study of multiethnic cohort in Hawaii found a weak, inverse relationship between the pattern characterized by vegetables intake and mammographic density in Japanese women only . Another recent study found a dietary pattern characterized by high-fat food choices was associated with increased risk of breast cancer incidence . Results from the Minnesota Breast Cancer Family Study showed the inverse association between Mediterranean diet score and mammographic density was only seen in smokers . All three studies assessed diet from food frequency questionnaires (FFQ) and relied on one single assessment of food intakes taken in midlife. Furthermore, while these studies have adjusted for total energy intake, the relationship between total energy intake and mammographic density were often not documented. While the mechanism by which dietary patterns characterized by high-fat foods during adult life affects mammographic density is unclear, [14, 16] one possible pathway may be through the ‘caloric restriction’ hypothesis. 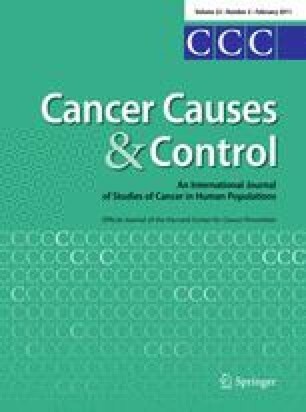 Animal studies show that, during sustained caloric restrictions, cancer risks decreased proportionally to the amount of restrictions [17, 18]. Of note that in a majority of the animal models evaluating energy restriction and cancer risk, the animals were subjected to lifelong dietary interventions . Recent results from the Women’s Health Initiative Dietary Modification Randomized Controlled Trial found that biomarker-calibrated energy intake was positively associated with breast cancer in post-menopausal women (hazard ratio: 1.23; 95% CI: 1.06–1.41) . Factors across the life course may increase risk of breast cancer [20, 21, 22] and thus dietary patterns at different ages may correlate with mammographic density. The Medical Research Council National Survey of Health and Development (MRC NSHD), a population-based birth cohort study,  provides a unique opportunity to investigate whether dietary patterns and energy intake in childhood and throughout adulthood are related to women’s breast density in midlife. The Medical Research Council National Survey of Health and Development is a British nationally representative sample of 2,815 men and 2,547 women followed since their birth in March 1946 . Medical, sociodemographic, and lifestyle data have been collected at over 25 follow-ups by home visits, medical examinations, and postal questionnaires. Ethics approval was obtained from the North Thames Multicentre Research Ethics Committee. At age 4 years, in 1950, a 24-hour maternal recall of all meals consumed was completed for 98% of cohort members . Nutrient intakes were later calculated using period and age-specific food portion sizes and nutrient databases. At ages 36 and 43 years, all food and drink consumed both at home and away from home were recorded in 5-day food diaries using household measures and estimating portion sizes according to detailed guidance notes and photographs provided at the beginning of the diary. The foods and nutrient intakes were calculated using the in-house suites of programs based on McCance and Widdowson’s The Composition of Foods and its Supplements . Participants who provided food diaries at ages 36 and 43 years with four or more days completed were included in the analysis. In the United Kingdom, all women aged 50–64 years are invited for 3-yearly mammographic screening as part of the National Health Service (NHS) Breast Screening Programme. Copies of the mammograms with two views (craniocaudal and mediolateral oblique for each breast) taken when the women were closest to age 50, the prevalent screening round, were requested from the relevant centers. We successfully obtained copies of mammograms for 1,319 of the 1,471 women who gave consent (90% tracing rate), the large majority [1,249 (95%)] from NHS breast screening centers. Films were not obtained for the remaining women due to insufficient contact information for the hospitals/clinics (37 in UK, 12 overseas), logistic difficulties in certain centers (n = 57) and other problems (n = 46) . The mammograms were scanned using an Array 2905 laser digitiser with optical density range 0–4.0, 12 bit depth and pixel size of 75 microns. Information for both mammographic density and food intakes was available for 1,161 (88%) participants. Percent mammographic density, absolute areas of dense (parenchymal) and non-dense (fatty) tissues were measured on the left craniocaudal view (n = 1,014) or, if this was not available, on the left mediolateral oblique view (n = 147) using Cumulus, a computer-assisted threshold method . Age at menarche (<12, 12, 13, 14+ years) was reported by the participants’ mothers when the girls were 15 years old or when this information was not available (for 9% of women) by the participants when they were 48 years old. Postal questionnaires were sent annually to women from ages 47 to 54 years to obtain information on menstrual characteristics and monthly change, hysterectomy and oopherectomy, and monthly hormone therapy (HT) use histories. These data were used to assess menopausal status at the time of mammography and, where appropriate, age at menopause. Women who reported no menstrual bleeding in the last 12 months were classified as post-menopause. Those with menstrual bleeding in the last 12 months, but not in the last 3 months, or with less regularity compared with the previous year were classified as peri-menopause. Those with menstrual bleeding in the last 3 months and with a regular or more regular menstrual bleeding than they had experienced in the previous year were classified as pre-menopause. Height and weight were measured by a research nurse at age 53, and BMI was calculated as weight/height2 (kg/m2). Other factors, obtained at age 53 years, included in the study were smoking status and level of physical activity. Adult social class was based on a woman’s own current or most recent occupation provided at age 43. The individual foods and beverages consumed at age 4 were summarized into 34 items. Due to the large variety of foods and beverages consumed during adulthood, 70 categories of related foods and drinks groupings were formed, for ages 36 and 43 . Dietary patterns were determined by factor analysis, conducted separately for ages 4, 36, and 43, using the method of principal components and varimax rotation. The number of dietary patterns identified was based on eigenvalues >1.25, identification of a break point in the screen plot and interpretability . Items were considered to load on a factor if they had a correlation ≥|0.30| with that factor . Inter-item reliability for each factor was assessed by Cronbach’s alpha coefficients. Since the dietary patterns identified at ages 36 and 43 were similar in relation to the number of factors identified and the foods that loaded highly, factor analysis was rerun on the average consumption of food items between the two adult ages to represent habitual dietary patterns during adulthood. Dietary pattern scores were calculated by taking the product of the weight of each food item consumed and the standardized factor scores and summing this value over all the food items. All foods and beverages items contributed to the calculation of dietary pattern scores. Thirds of dietary pattern scores were used in the analysis. Percent breast density was square root transformed and then standardized. Multivariable linear regression models were used to investigate the relationship between percent breast density (and the absolute area of dense and non-dense breast tissue) and the main exposures of interest, namely dietary patterns in thirds (at ages 4, 36, and 43), while adjusting for mammographic view (craniocaudal, mediolateral oblique), age at mammogram (continuous), body mass index (BMI) at age 53 (continuous), age at menarche (<12, 12,13,14+ years), menopausal status at the time of mammography (pre-, peri-, post-, hysterectomy), HT use (current or ever), parity (0,1,2,3, 4+), smoking status (current smoker, non-smoker), level of physical activity (nil, moderate, high), and social class during adult life (non-manual, manual) (Model 1). Total energy intake was included in the final model in order to assess if it attenuated the relationships between the dietary patterns and mammographic density (Model 2). Linear trends across thirds of dietary pattern scores were also calculated. The multivariable analyses were performed on complete case data. Statistical analysis was conducted with SAS Version 9.1 , and differences with p-values <0.05 were considered to be significant. Table 1 presents the reproductive and lifestyle characteristics of the 1,161 participants with data on mammographic density. The mean age at mammography was 51.5 years. Results from factor analyses revealed three dietary patterns at age 4 years and four dietary patterns during adulthood. Tables 2 and 3 present the factor loading for these dietary patterns. A positive loading indicates a positive association between the item and the dietary pattern. At both stages in life, the identified dietary patterns explained approximately 15% of the variance in the consumption of all the food items. Based on the type of food items consumed with factor loadings ≥|0.30|, dietary patterns at age 4 were labeled as breads and fats, fried potatoes and fish, and milk, fruit and biscuits (Table 2). Four dietary patterns were identified during adulthood. Patterns emerging among the women were labeled ‘low fat, high fiber’, ‘alcohol and fish’ (which includes items indicative of a Mediterranean style diet), ‘high fat and sugar’, ‘meat, potatoes, and vegetables’ (Table 3). There was no evidence of an association between dietary patterns or energy intake at age 4 and percent mammographic density (Table 4). During adulthood, a higher energy intake and increased consumption of items in the alcohol and fish pattern and high fat and sugar pattern were associated with higher percent mammographic density. (Table 5; Model 1). However, in the mutually adjusted model, only energy intake remained positively associated with mammographic density (Table 5; Model 2). The effect of the high fat and sugar pattern on dense tissue area was greatly attenuated when total energy intake was taken into account. Higher energy intake was significantly associated with a larger area of dense tissues (Table 6; Model 2). Neither dietary patterns nor energy consumption was associated with area of non-dense tissues. This analysis identified that total energy intake rather than specific dietary patterns during adulthood was associated with percent breast density. The weak effect of a high fat and sugar pattern (characterized by high intakes of sweet biscuits and cakes, whole milk, confectionary, sweet puddings, and butter) on mammographic density remained when total energy intake was taken into account. There was no evidence of an association between dietary patterns at age 4 or energy intake and percent breast density. In terms of dense/non-dense areas of the breast, the effect of adult dietary pattern of high fat and sugar pattern was slightly attenuated when total energy intake was taken into account. A positive association was found between total energy intake and area of dense tissue. The lack of evidence of a relationship between adult dietary patterns and mammographic densities in our study was consistent with results published recently showing no significant association between the ‘fat and meat’ pattern and mammographic density in a large multiethnic Hawaiian cohort . In the present study, we did not find any associations with dietary patterns characterized by the high consumption of vegetables. This agrees with the findings from the Hawaiian cohort among Caucasian women . However, in the Minnesota Breast Cancer Family study, no strong evidence for associations of dietary patterns with breast density was found, but a weak inverse relationship was identified for the fruit-vegetable-cereal and salad-sauce-pasta/grain dietary patterns . As mammographic density is a surrogate marker for breast cancer risk, it is informative to compare the findings of dietary patterns with respect to breast cancer cases. Positive associations were also observed in the European Prospective Investigation into Cancer and Nutrition–Potsdam study where a dietary pattern characterized by high-fat food choices was associated with the incident of invasive breast cancer . In the Women’s Health Initiative Dietary Modification Randomized Controlled Trial, a weak inverse relationship was found between a low-fat diet and invasive breast cancer in post-menopausal women (hazard ratio: 0.91; 95% CI: 0.83–1.01) . Our data provide weak evidence of a positive association between the high fat and sugar pattern and mammographic density. While the role of energy intake on mammographic density is unclear, there is substantial evidence for increased breast cancer risk with high energy intake [31, 32]. Numerous biological mechanisms have been postulated to explain how increased energy intake promotes breast cancer risks including through: (1) the alterations in the production of ovarian steroid hormones, particularly estrodial, which is believed to increase breast cancer risk ; (2) the changes in the availability of insulin growth factor-1, which in turn, promotes tumor development by increasing cell proliferation ; (3) the increase DNA replication rate reduces the rate of apoptosis, thus increasing tissue susceptibility to damaging carcinogens . However, research on the women exposed to the 1944–1945 Dutch famine, a relatively short, severe famine during in World War II, found an increased breast cancer risk [36, 37]. The authors concluded that being exposed to “normal” diet after a period of short and transient period of restriction could be detrimental [36, 37]. The high-energy associations with percent density reflected mainly positive associations with the dense area. From our previous work where we have shown that dietary patterns tracks in adulthood,  it may be possible that sustained high energy diet may lead to high mammographic density through one of the biological mechanism mentioned above. To our knowledge, no studies have investigated the role of dietary patterns during adult life using repeat measures of dietary intakes (seven years apart) with mammographic density in midlife. The prospective nature with dietary data collected prior to mammographic screening, sample size, length of follow-up, and wide range of potential risk factors are major strengths of this study. The MRC NSHD is one of the few cohorts with measures of diet collected in childhood and with repeated measures throughout adult life. Dietary intakes in adulthood were based on diaries rather than FFQ, which provided detailed data on the variety of foods consumed. The single 24-h recalls, used at the age of 4 years, are not generally considered to be reflective of usual intake and not the preferred dietary assessment method for associations with health or disease outcomes. However, the diets in the 1950s were much less variable than in more recent times, and a dietary pattern shown for one day is likely to be repeated throughout the week, particularly major foods such as fruits and vegetables, meat, and milk . We have already shown that these dietary data are robust enough for epidemiologic studies, when used either to compare group means or with rank subjects according to the levels of food consumption . Period-specific food composition databases were used to calculate intakes allowing for real changes in food composition over time to be incorporated into the exposure measurement. Percent density readings were highly repeatable (90 films were independently and blindly re-read, giving an intra-class correlation coefficient of 0.91, 95% CI: 0.89, 0.93), and relationships with the established determinants of density (e.g., BMI, menopausal status, and hormone therapy use) were observed, giving weight to the validity of the outcome data. This study supports the hypothesis that high energy intake, rather than any specific dietary patterns, established in mid-thirties is associated with mammographic density in later life. Our study supports the hypothesis that high energy intake during the mid-thirties and early forties is associated with mammographic density measured 15 years later. Further research is warranted on the repeatability of these findings and to investigate potential underlying mechanisms. This work was funded by the Breast Cancer Campaign UK, the World Cancer Research Fund International and the Medical Research Council.